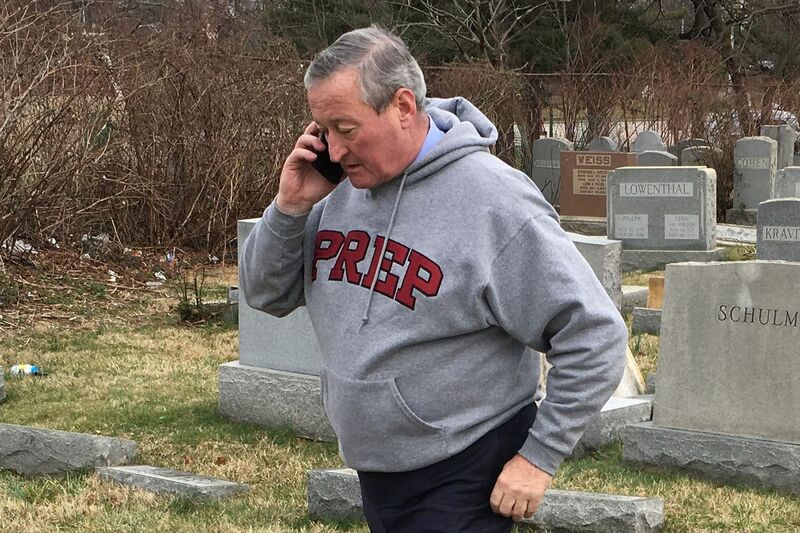 Mayor Jim Kenney talks on his phone as he surveys the damage at Mount Carmel Cemetery in February 2017. He navigated two big controversies — the decision to evict, then reinstate the Made in America concert on the Ben Franklin Parkway and the nonrenewal of the city’s data-sharing contract with federal immigration authorities. A massive water-main break in Center City shut down streets for weeks. And Philadelphia’s first-term mayor went on his first international trade mission. But residents might never get a complete picture of how Kenney managed the city during those testing times. He deleted all text messages on his phone for the month of July. As he had, it turns out, during the months and years that preceded it. Habit or not, the move may violate state open records laws. Any communication — electronic or paper — as it relates to city business is subject to the state’s Right-to-Know Law and considered a public record. And those records are intended to be preserved to help citizens see and understand how public officials govern and tax dollars are spent. Gamble said the mayor’s staff weren’t aware he was deleting his text messages until the Inquirer and Daily News filed a Right-to-Know request in August that asked for Kenney’s emails and text messages as they related to city business in July. Philadelphia Mayor Jim Kenney with his phone. Although Kenney often carts his phone with him and is routinely seen texting in public, the mayor doesn’t use text messaging as his primary form of government communication, his spokeswoman said. Gamble said that by the time the newspapers’ request came in, the mayor had already deleted his July text messages and he had not backed them up to his iPhone’s Cloud. And though Kenney, like most officials, often carts his phone with him and is routinely seen texting in public, she said the mayor doesn’t use text messaging as his primary form of government communication. He mostly talks to people in person or on phone calls and gets briefing books every morning with the day’s talking points, agenda, and notes, she said. “He’s old-school. He’s 60 years old,” Gamble said. Since 1992, the city has had a records retention policy that calls for the preservation of records “regardless of physical form or characteristics” and “in connection with the transaction of public business and preserved or appropriate for preservation as evidence of … activities of the City.” Records have to be retained for a specific number of years depending on the subject or department. Some have to be kept permanently. The city’s current record retention schedule states that, regardless of format, all general correspondence and subject files within the Executive Office of the Mayor’s Office should be permanently retained. Gamble said that since the Inquirer’s request, Kenney has been advised to not delete any more text messages. She added that the city’s Law Department is looking at what other cities do and trying to come up with a policy specific to text-message retention. The Inquirer has filed an appeal with his office over Kenney’s text messages, asking it to ensure that the mayor’s office made “a good-faith effort” to retrieve the July messages, including contacting the mayor’s cell phone carrier to search for the deleted texts. Abdo said that the issue of elected officials using private cell phones for government business isn’t unique to Philadelphia.